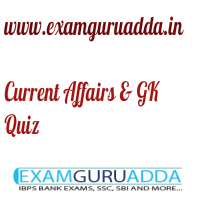 Dear Readers Examguruadda.in presents Current Affairs quiz of 7-8 September 2016 that cover important current affair events. Current Affairs quiz prepared according to the latest Bank, SSC and other competitive exam. 2. Which movie won the best film award at the first BRICS film festival ? 4. 2016 Group of Twenty (G20) Summit from 4th to 5th September 2016 was held in which country of china.? 7. CBDT has launched the ambitious _____ facility for online redressal of taxpayers’ grievances related to refunds, ITRs and PAN. 8. In which city of TamilNadu Mexico has set consultate to explore Free Trade Agreement with India? 10. Name the Satellite launch vehicle that was used to launch the advanced weather satellite INSAT-3DR by ISRO?